Changing your clothes to accommodate for changes in the weather is the norm, but how often do you think about the changes you need to make to your skincare routine? As the weather drops you may grab a scarf or put on a jacket, but do you also add an extra layer of moisturizer? 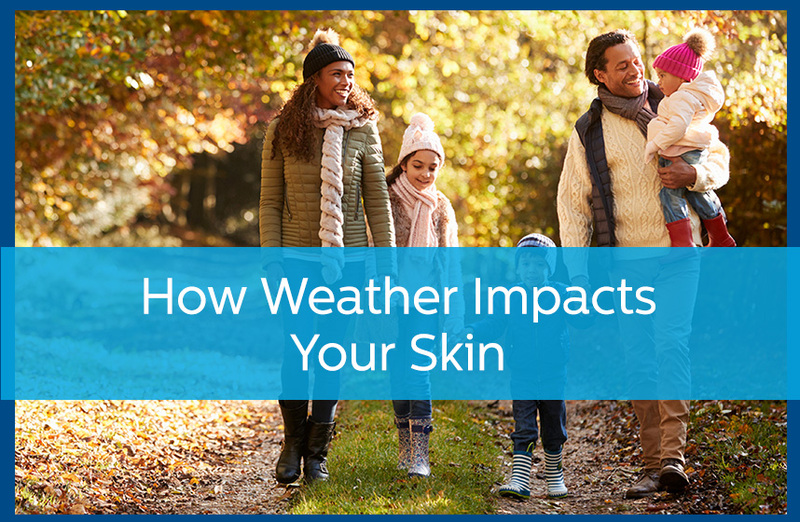 There are a lot of skin issues that actually stem from the climate, and being aware of how to deal with those climate issues can have a huge impact on your overall skin health. When its cold out, your skin is going to become dry. The cold weather dries out the pores, causing your skin to become easily irritated and requiring you to use additional moisturizer to keep it feeling healthy. The dryness is actually why the cold weather causes your skin to become cracked, leading to uncomfortable itching and skin that is tough to the touch. Simply vamping up your moisturizing routine come winter isn’t the smartest thing to do, however. Too much oil in the moisturizer may lead to acne or similar blemishes, just as using a perfumed moisturizer could lead to irritation. Talk to your dermatologist about the best moisturizing practices for your skin’s health. Just as your skin is likely to dry out in the cold weather, increased heat can cause its own issues. The heat isn’t likely to dry out your skin—unless, that is, excessive exposure to the sun has caused you to develop a sunburn. Increased heat often is accompanied by increased humidity, which can leave your skin oily and your pores clogged. Using a cleanser during the warmer months of the year to clear all of that sweat and dirt build-up from your pores is the best way to prevent issues like breakouts as a result of the weather. And if you do find yourself faced with a sunburn, then make sure to up the moisturizing so that you can help your skin’s health bounce back from being dried out from the UV rays. Even as the weather changes, there are some routines that ought to stay consistent to help your skin stay healthy. Talk to your dermatologist about developing a skincare routine that makes sense for your skin. Whatever the season, putting your skin’s health first can help you stay comfortable and looking great all year round. Before you make any changes to your skincare routine, talk to your skin care specialist at Avail Dermatology. Contact Avail Dermatology today and schedule an appointment with us.